My mom really likes the tilapia with crabmeat dish at Bravo Cucina Italiana. 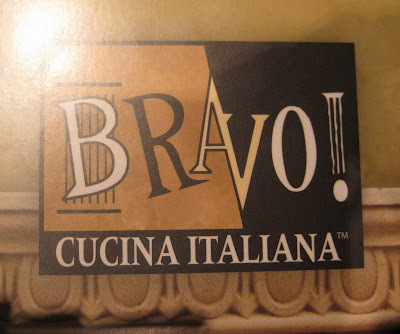 Unfortunately, there are no Bravo restaurants in Nevada. This means that when she visits Pittsburgh, she likes to go to to Bravo. Wednesday evening SP had to work late - he had to be at work until at least 8 pm, later if there was an issue. So after mom & I checked out the new Kirkland's that recently opened in Robinson (across from Ikea, in the same strip mall as the post office, liquor store, Jo-Ann) we went to Bravo for an early dinner. If you go on a Wednesday around 5 pm, you are seated right away - yay! We settled in and I ordered iced tea while mom had a glass of Merlot. 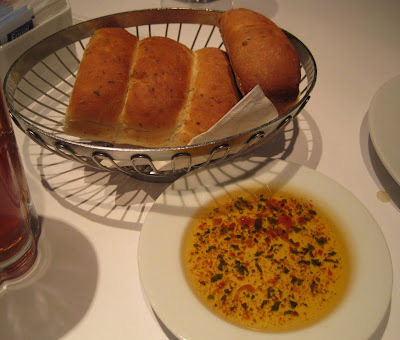 Along with our drinks came the usual herb filled Bravo bread and dipping oil. Mom said that someone told her they really enjoyed the fried ravioli at Bravo, so she wanted to order that as an appetizer. Crispy Mozzarella Ravioli -- fried cheese-stuffed ravioli served with marinara, basil, and creamy horseradish sauce: There were 8 fried ravioli on a long plate with 2 sauces. 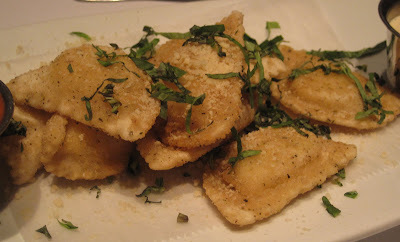 Here's a close up of the ravioli sprinkled with lots of fresh basil: These were quite tasty. Very cheesy, which is good. I liked both the marinara and the horseradish sauces but stuck with the marinara. Mom stuck with the horseradish sauce. We ate all of them -- we figured they wouldn't reheat well, and, well, fried food is just really yummy. They weren't greasy, which was nice. And fresh basil is always tasty. 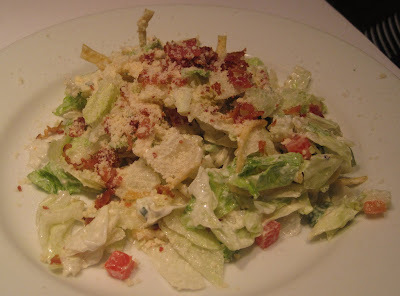 Mom ordered an Insalata Della Casa -- chopped greens, cucumber, tomato, bacon, crispy pasta and creamy Parmesan dressing: We both like this salad. It wasn't swimming with dressing. The crispy pasta bits are a nice change from croutons. We both like that everything is chopped so tiny. One thing I dislike about eating salads when I dine out is trying to cram huge leaves of dressing laden lettuce into my small mouth. This salad was easy to eat. I decided to try a cup of Lobster Bisque -- a rich, hearty cream soup finished with a touch of sherry and garnished with diced, poached shrimp: There were lots of tiny shrimp bits in the soup, which was nice. I definitely could taste the sherry. It arrived piping hot and I burned my mouth -- I'm glad it came so hot but I should have waited a bit before slurping up a spoonful! We both liked the soup, but I'm not sure if I would order it again because it made me very thirsty. I drank an entire iced tea before the entrees arrived, and that is extremely unusual since rarely do I finish an entire iced tea in the course of an entire meal. I was surprised when mom ordered Grilled Chicken Marsala (marinated chicken breast with mushroom Marsala wine sauce, Tuscan mashed potatoes and pan roasted green beans) instead of Grilled Tilapia With Crab (flaky tilapia topped with jumbo lump crab and lemon butter sauce served with the vegetable of the day and crispy potatoes). 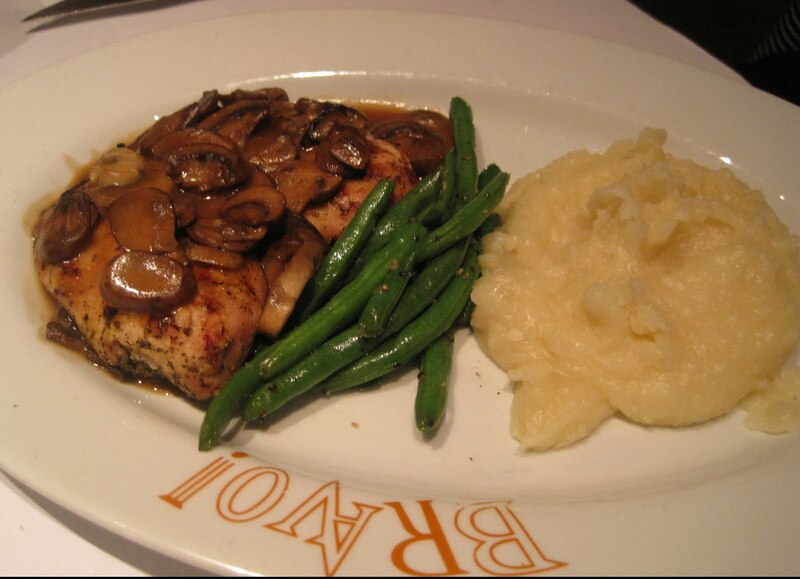 The portion of chicken is quite large and it's covered with lots of mushrooms: The mashed potatoes were garlicky and the beans were crunchy, which is how mom likes her green beans. Mom really liked her meal although she ate only half and brought the other half home. 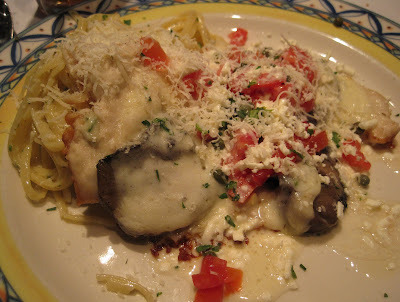 I opted for Chicken Scaloppini -- sauteed chicken with roasted portobello mushrooms and Provolone with lemon caper butter sauce, Feta and diced tomatoes and served with herb linguine: Since dinner was early for me and since I ate the ravioli, soup, and some salad, I barely put a dent in my meal. The chicken is nice & thin with that briny caper and tart lemon sauce taste. Lots of feta and tomatoes plus very tasty mushrooms. The herb pasta is tasty, too. My only quibble, and it is very minor, is that a true scallopini, to my knowledge, does not have feta and tomatoes. This is not a criticism - the menu clearly states the ingredients and it tastes fine, I'm just always surprised by the addition of feta & tomatoes to a scallopini dish. We were too stuffed to have dessert at the restaurant but we got 2 desserts to go: Tiramisu (lady fingers layered with coffee liqueur, mascarpone cheese, and cocoa): and Bravo's Famous Cheesecake (rich and creamy cheesecake topped with caramelized sugar and creme anglaise): I took the photos Thursday morning, after we devoured half of each dessert Wednesday night. 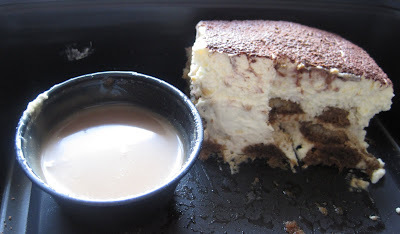 I really like Bravo's tiramisu. It's very light and airy with lovely coffee-mascarpone-cocoa taste and I like the coffee sauce. The cheesecake was for mom & SP. Mom was too full to try any. SP ate half when he got home from work and said it was tasty. 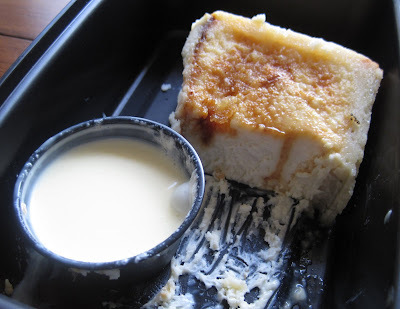 I thought the bite of cheesecake I had was just OK. My little taste seemed very dense and filling but the caramelized sugar is a nice touch, very creme brulee like. 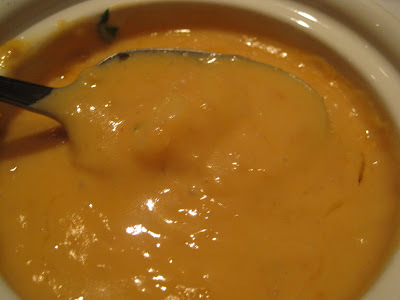 I tasted the creme anglaise when I took the photos and really liked the flavor. As far as chain restaurants go, I do like Bravo quite a bit. I like that the portions are large enough to eat half and take home half for another meal. The food is tasty - I've never had a bad meal (well, I can think of one time that the creme brulee wasn't too great). I was surprised, however, that the bill came to $76 before tip. That seems pricey for a chain restaurant. I can think of several non-chain places with yummy food and where the total bill would have been much less. It makes sense when I add up everything we ate/drank, and I didn't think anything was super pricey when I was perusing the menu, but somehow I have this idea that a chain restaurant just shouldn't cost that much for 2 people (of course, places like Morton's and Ruth's Chris are chains and cost even more, but... they are not usually in suburban strip mall areas)! The service at Bravo is always fine. Our server was friendly. She chatted a bit but not too much. Plates were cleared promptly. Drinks were re-filled promptly. Our food did not arrive too quickly nor too slowly. This was one time at Bravo in Robinson when I didn't feel rushed -- sometimes I feel a bit rushed because they get so busy, but usually I am there later in the evening so maybe going earlier gives you a more leisurely dining experience - ? Tasty food with leftovers for another tasty meal -- always a good thing. If you're going to go chain Italian, I think Bravo! is the way to go. Their service is always friendly and attentive, and their food is consistently good. I always order the seafood pasta with mussels, scallops, crab, and shrimp, and I'm always pleased. It's definitely a good place to take family. Last few family visits to town, we've gone to Bravo! My gram loves it too.